This piece was my submission to a unique exhibition of 61 fiber artists, all members of the International Freeform Artist’s Guild. Each artist selected one yarn and sent 61 five-yard skeins of that yarn to a central location. In return, each artist received 61 different skeins from fellow artists all over the world. There was no coordination of color, texture, or any other artistic components. 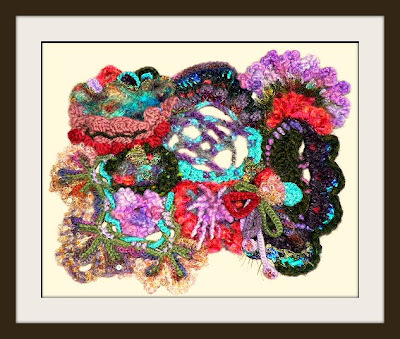 The challenge was to create your own interpretation of fiber art using only those yarns. The collaboration of scrumbles became a traveling exhibition throughout 2006. This was the first exhibition of its kind, conducted by the Guild. Since 2006, it has been an annual event. They have just put up the photos from this years exhibition, entitled "Somewhere in My World". It is such inspiring work from a talented group of artists! Is there all 61 there? That sounds like an expensive undertaking! The Fanfare Cowl Pattern is Now Out! Covered Snaps-The Perfect Finishing Touch!